The Redtail Pocket Rocket is our high performance short board. Shaped one at a time to custom specifications. Design features - Rockers: fall into one of three primary groups - "speed boxes" designed for all conditions, "continuous" designed primarily for for quality waves, and "flat backs" designed for marginal to moderate waves. Profiles: crisp with sufficient volume integrated into these designs to support the surfer, accelerate and carry speed, yet thinned appropriately in the nose, tail , and rails for complete control. Outlines: any one of the classic configurations - squash, thumb, swallow, and round pin. Bottom Contours: shallow vee in entry, moderate single concave begins between entry and wide point, reaches maximum depth near the leading edge of rail fins, and fading through the tail with optional single to double concave from wide point through the tail. The single has a little more lift and speed and the single to double has a little more control. Rails: vary with displacement and surfer's technique - fuller rails for technique that generates greater displacement - thinner rails for a more light footed technique. 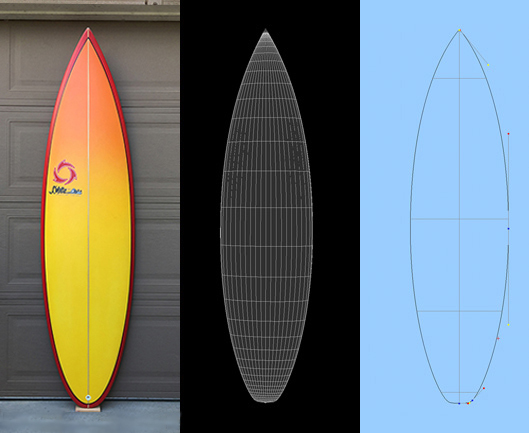 See essays on volume and displacement on the Natural Curves Design page for more insight on how surfer and technique relate to board design. Speed Box Rockers These designs feature an area of flatter rocker under the surfer's torso and hips when paddling and under the surfer's stance when surfing. This "speed box" will vary in length and the tail and entry rockers are tuned to surfer's requirements. This rocker profile can be tuned to a great variety of conditions. Continuous Rockers These designs feature continuous rocker from entry to tail. They excel in crisp and hollow waves. These conditions generally provide all the speed and power required for solid performance surfing. The continuous rocker profile keeps the board free and loose in the pocket and in the tight transitions experienced in challenging - quality waves. Flat Back Rockers These designs feature low tail rocker. This rocker profile excels in marginal and moderate conditions by generating and carrying speed in and out of the pocket without sacrificing control in powerful surf.